This calculator is a rare combination of the TI-1025 with the wooden keyplate of e.g. the "electronic Wizard" and we don't known the name ! 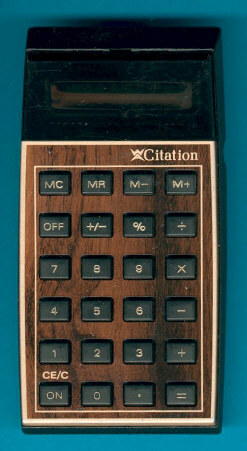 The box of the calculator states 66-4986-7 but this number was given already the earlier Citation. Everything else is identical, even the back of the calculators tells you the manufacturer Texas Instruments.